More commonly referred to as simply “Dr. Dan”, he is a guy wearing many hats! A 1993 graduate of Iowa State University College of Veterinary Medicine, Dr. Dan has been co-owner of Riverside Animal Hospital since 2001. Dr. Dan has also served as the President/Executive Director of The Animal Emergency Center of the Quad Cities since 1999. To top it all off, Dr. Dan has been the Program Veterinarian at the Muscatine Community College Veterinary Technician program since 2010. Interested in all aspects of veterinary medicine, Dr. Dan does have a special interest in orthopedic and soft tissue surgery, laser applications for surgery and healing, plus current and new medication and medical techniques. He has found it especially gratifying to see the positive affects our new therapy laser has had on his orthopedic surgical cases! Dr. Dan, an avid cook at home, has been taking it on the road! His tail-gates at ISU football are legendary, and he has been crowned the Bar-B-Que King at an ISU Grilling Competition! He also stays busy playing racquetball, golf and gaming. Ken joined the Riverside staff in 2016. He recently retired from a 30-yr career working in the credit union industry. Working in all areas of banking, he spent the latter part of his career working in operations and process management. We are pleased to have his wealth of experience to assist in managing the financial side of our practice. If the name sounds familiar, it is. Ken and Dr. Dan are cousins. In fact they are double cousins, as their mothers married their fathers. He is very excited to assist behind the scenes to enable Riverside staff to devote more time to their clients. In his spare time, Ken loves to be on his bicycle. If the sun is out, the wind is down, and the trails are clear: even a winter day won’t keep him inside. He is also an avid bowler, with nine career 300 games and 22 (and counting) national tournaments under his belt. Nicole Harper is our newest Client Care Specialist as of November 2016. She is learning the ropes of the front desk quickly and we have started training her to help out the veterinary technicians when they need assistance. Once she is fully trained she will be a jack of all trades! Nicole has a few fur babies herself, most recently a Blue Heeler named Jager. Nicole likes to help out on her boyfriend’s cattle farm on her time off, yet always makes sure she finds time to hunt despite her busy schedule! 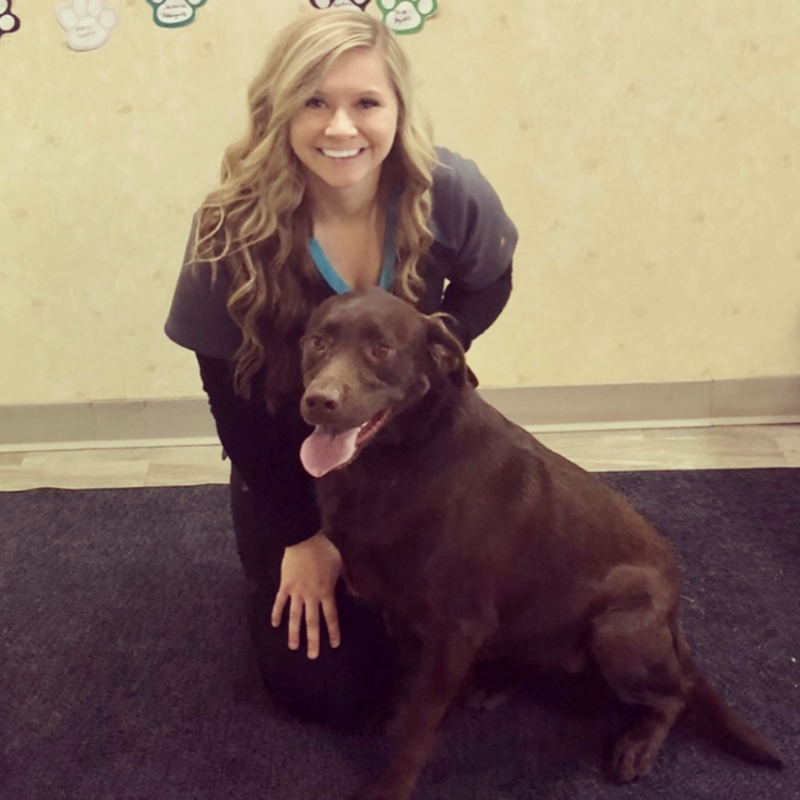 Liz joined the Riverside Team in March 2018 for her veterinary technician internship and was soon hired on after she charmed the hearts of her fellow employees. Liz graduated from the Veterinary Technician program at Muscatine Community College in May of 2018. She took the veterinary state board exam in June shortly after graduating and is hopeful that she will be passing her national exam soon, so we can finally call her a Registered Veterinary Technician! Liz enjoys her life living in the country with her two rescue kitties, Mila and Lenny; as well as her very cute and hyper Labrador retriever, Maggie. In her free time she enjoys hunting, fishing, and riding horses. Liz loves helping animals (of course), but also loves helping people in her community by serving as a volunteer firefighter for the Grandview Fire Department. After Liz passes her national boards, she plans to go back to school to become an EMT to further her education in medicine and to help more people. Zuzu is quite new to our staff at Riverside, and we are really excited to have her.